The situation in the coastal sector was most tense. Over the past day, Russian-occupation troops 21 times opened fire on the positions of the Ukrainian military in Donbas. The situation in the coastal sector was the most tense as the enemy fired the light 122-mm portable rocket systems and IFV weapons at ATO positions in the area of Shyrokyne. With IFV weapons, anti-aircraft unit ZU-23–2, grenade launchers of various systems and heavy machine guns, militants shelled the defenders of Maryinka. Krasnohorivka was attacked with anti-tank grenade launchers, and Vodiane – with IFV weapons and heavy machine guns. Ukrainian marines stationed near Hnutove were fired at from small arms, ATO headquarters reported on Tuesday. Enemy snipers were active in the area of Maryinka. 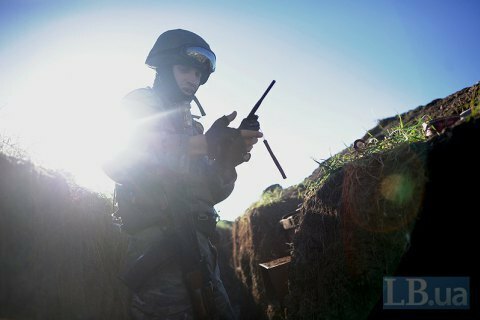 In the Donetsk sector, the enemy pounded ATO positions near Avdiyivka and Verkhnyotoretske from 82-mm mortars, anti-tank grenade launchers and heavy machine guns. In the vicinity of Troyitske and Pisky Ukrainian units were shelled from anti-tank grenade launchers and small arms. In the Luhansk sector, the enemy used small arms in the area of Novooleksandrivka. The ATO forces strictly adhered to the ceasefire accord and did not open return fire. The spokesman of the Defense Ministry on ATO issues Col. Andriy Lysenko at the morning briefing on Tuesday stressed that the Armed Forces of Ukraine have sustained no casualties over the past day. A 30-year-old volunteer received a fragmentation wound and an open fracture of arm due to the shelling of Maryinka by Russia-backed militants on Monday evening.